Lander is an Android and Java port of the 1990 game by the same name for Windows 3.1. It is similar to the classic Lunar Lander game that everyone knows. One difference that sets Lander apart from the rest is that it uses side thrusters to change horizontal velocity and doesn't rotate (though the option was added to v1.1.0 of the Android version). For this port, permission and v1.3 source code has been provided by the original developer, George Moromisato (neurohack.com). The Android port is complete with the current focus of adding optional modifications. 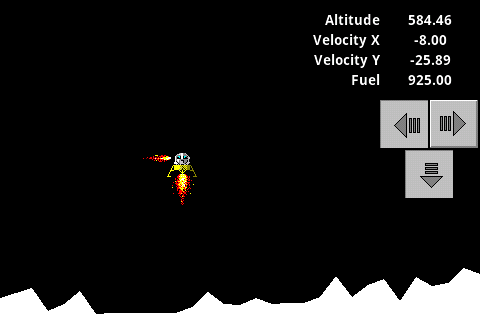 The Java port is in alpha and playable in the browser as a Java applet. Android screenshot of v1.0.0 gameplay on an HVGA screen size (480x320).